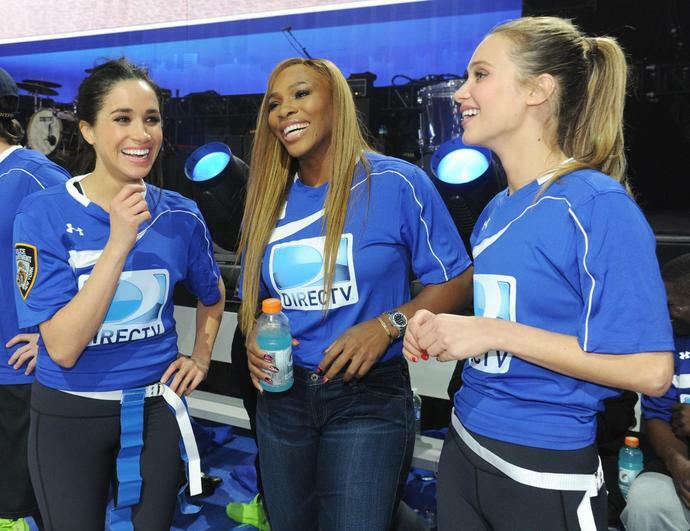 Serena Williams and Meghan Markle continue to prove that they are the epitome of #FriendshipGoals, despite living oceans apart and being two of the most famous women in the world. Williams opened up about her royal BFF in a new interview with Australian television's "The Sunday Project"-taped just days after the controversial final of the U.S. Open. "We were actually just texting each other this morning," she says of the Duchess of Sussex. "We have known each other for a long time, but we really kind of are relying on each other right a lot recently," Williams revealed when asked if they give each other advice on the media scrutiny they face. The two reportedly met back in 2010 and have been dear friends ever since. Williams and her husband, Alexis Ohanian, famously attended Markle's wedding to Prince Harry in May and also were spotted at a polo tournament with the royal couple this summer. Williams also shares why she thinks Meghan and Harry's wedding was so important on a global scale. "To have such a monumental moment in England, nonetheless of all the places, I felt like we were literally watching history," she says in the interview. "I feel like in a few years we are going to look back at that moment and it's going to be so historic. It's going to be something that people never forget. The whole service was really wonderful, and most of all I just wanted to see my friend be happy. And I think that's what happened." And it's no wonder they've needed a little extra support as of late-they've both had quite the whirlwind year. Markle has been navigating her public role as a duchess after planning the wedding of the year-even hosting her first solo event this week with her mom and husband by her side. Serena has been working her way back to the top of the tennis world after giving birth to daughter Olympia last year. Along the way, she's had to deal with controversies about her attire and her behavior, played in two Grand Slam finals, and designed a new clothing line. But it seems the two are never far from each other's minds. The royal sat in the royal box at Wimbledon (along with her sister-in-law Kate Middleton) to cheer Willams on in the finals. And Williams named one of the pieces in her new collection the "Royal Duchess Hoodie" which we can only imagine is a tribute to her friend. You can watch Serena's full interview below. The royal family celebrates Easter Sunday on the Queen's 93rd birthday with a church service and a birthday song. Kate Middleton's little sister is passing on her love for fitness to her baby boy.